The debate about population is too often dominated by a belief that developed rich societies face severe problems, some would say crises, as a result of demographic change. The change has two elements: a steady rise in life expectancy, and a one-off fall in fertility – the combined impact of which has been to shift the demographic pattern of rich developed countries from pyramids to columns, and in some cases to columns tapering at the bottom. It Is obvious that when that shift from pyramids to columns occurs, the ratio of people above some given retirement age (say 65) to those of working age (say 20 to 65) rises, so that the so called "old age dependency ratio" increases. And clearly that creates problems for pension systems – whether funded or unfunded. In the unfunded case we have fewer taxpayers per pensioner: a problem. But in the funded case we may have people attempting to save more to support a longer time in retirement – and that too may have a self defeating impact on rates of return. It is frequently argued, therefore, that not only do rich developed countries have to tackle the challenge of pension system reform, but they should also consider policies which might re-expand the base of their pyramid – encouraging higher fertility or higher immigration. I would like to challenge the idea that the developed world in general faces a crisis, and instead set out four alternative conclusions. Firstly, most countries in the developed world face an important but quite manageable challenge of pension system redesign. Second, in some countries the problems are severe, and more radical demographic responses may be optimal. Thirdly, in some rich developed countries, conversely, population growth is more rapid than optimal. And fourth, across the world the biggest demographic challenge is rapid population growth in parts of the developing world, not the manageable problems of aging in rich developed countries. Some of these conclusions, and in particular the first three, depend on judgmental trade-offs between factors, some of which are inherently subjective matters of individual preference. What I do not think can be challenged is the need to make an explicit trade-off between the factors I will set out, a trade-off which is not seen in some analyses of these issues. My proposals, therefore, are as much focused on the required methodologies of analysis as on any particular set of conclusions. Many commentators overstate the scale of the challenge in many developed countries, and as a result argue that demographic responses are essential when, in most cases, intelligent pension system redesign is sufficient. One key cause of that overstatement is implicit from describing the ratio of over 65s to 20-65s "the old age dependency ratio". For this is only an accurate description if we assume that, in the face of gradually rising longevity, the average age of retirement stays unchanged. But a more sensible assumption is that, as people live longer, they divide the extra years of life between extra work and extra retirement leisure so as to keep roughly stable the proportions of adult life spent working and in retirement. And when we shift to that more sensible assumption in the UK a full half of the apparent rise in the dependency ratio between now and 2050 disappears. Beyond 2050, there will be no further rise in the dependency ratio as long as we continue to apply the principle of proportionally-rising retirement ages, and as long as there is no further decline in the fertility rate. So, we are hugely overstating the challenge – in the case of the UK exaggerating the challenge by a factor of two, simply by using a dependency ratio based on the unreasonable assumption of unchanged retirement ages. But some argue that, despite increasing longevity and increasing years of healthy old age, people are not choosing to work longer. Why not? Why, instead, did we see in many developed countries a fall in average retirement age from 1950 to the mid 1990s? Why, indeed, have we seen the percentage of adult life spent in retirement, increase even more than it would have if the average retirement age had simply stayed stable? The answer seems likely to be twofold. First, countries and companies have, in their pension system design, created economic incentives for people to retire early and disincentives against working later. But there is probably a second reason why people have been devoting an increasing percentage of adult life to retirement. 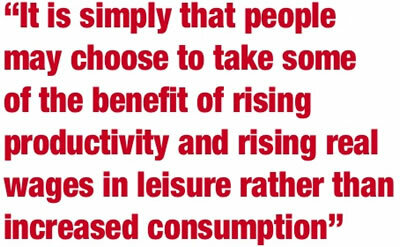 It is simply that people may choose to take some of the benefit of rising productivity and rising real wages in leisure rather than increased consumption. With sensible policies, the so-called problem of population ageing becomes manageable. Those sensible policies include changing the parameters of state Pay As You Go pension systems so as to reflect rising life expectancy. This can be achieved in two ways. First, by continuing to fix a "standard age" of state pension receipt, but increasing this standard age in line with increasing life expectancy, while also allowing people the option of deferring the pension till later in return for a fair increase in pension received. Or, second, by moving to a notional defined contribution system (such as Sweden's) in which people choose when to convert their accumulated balance into an annuity, with the annuity rate offered at any given age falling as life expectancy rises. Policy one alone, in the UK context, deals with half of the problem of future fiscal strain. But even the problem that remains is, in the UK's case, clearly manageable. Faced with this potential increase in pension expenditure, the UK has two further options. One would be to increase the state pension age (SPA) still further. If it were increased to 72 by 2050, no increase in pension expenditure as a percentage of gross domestic product (GDP, or national income) would be required. While such an increase would be politically difficult, and create some welfare loss, it cannot be considered impossible, since it would only return the SPA to the same relationship to life expectancy in old age which pertained in 1990, catching up for our failure to adjust pensionable age in line with life expectancy over the past 35 years. The other option is to accept either that total public expenditure as a percentage of GDP will increase, or that other elements of public expenditure will be reduced. These costs could be avoided were fertility or immigration higher. But both fertility and immigration increases may reduce national welfare, either as captured through the national income or through less tangible effects. The key question is not whether the population is "ageing" on some mechanistic measure, but whether the demographic developments likely to occur in rich developed countries will be optimal, or whether either faster or slower population growth would be desirable. To understand the dynamics of population growth and dependency ratios, it is necessary to define the "Combined Replacement Ratio" (CRR). This captures the impact of both fertility and immigration. If this ratio is above 2.0-2.05, a country would in the long-term have a growing population even if longevity were not increasing—even a slightly lower CRR will still produce population growth. Thus, with immigration, a country can have an expanding population even if its fertility rate is significantly below 2.0. In the UK, the CRR is currently running at about 2.48, because of high immigration. That is why the UK's population is forecast to grow significantly, from 60 million today to 70 million in 2050. A strong case can be made that this level of population growth is above the welfare maximising level. But clearly the balance of pros and cons would be different if the fertility rate were not 1.74 but, say, 1.3 and if there were no prospect of significant immigration, so that the CRR would also be far below 2. Consider the case of Italy, with an estimated CRR of 1.5. In other words, Italy's CRR is far too low. If, as I believe, a CRR of something like 1.9-2.0 is optimal, and only below 1.7 a "crisis", it is clear that the developed world includes many countries which are above the optimal level as well as some below. The UN-defined Northern Europe group of countries is likely on the medium projection to have a CRR significantly above 2.0 throughout the next 50 years. Within the European Union it is only in the eastern countries that the CRR is likely to run long-term at a level clearly below the optimal level, and clearly in "crisis" territory, with very low fertility rates being combined with net outward migration, and with significant inward immigration unlikely. Generally, we can define the conditions where it might be legitimate to talk of a severe demographic challenge or even a crisis, rather than simply a challenge of pension system reform. These would be countries where the birthrate is far below replacement level and where there may be cultural barriers to accepting significant immigration, or where there is unlikely to be significant immigration because people are unlikely to be attracted there. Japan and South Korea may be in this category; so too may Belarus and Ukraine – each is forecast to face not population stabilization but significant decline. (Russia may also face a significant population decline, but would not necessarily be in the crisis category because it is rich in natural resources). The overall picture however is not how many countries face "crisis," but how few. We are in danger of overstating the severity and generality of the problem of aging and low fertility in the developed world. In so doing, we are in danger of diverting attention from the world's really big demographic challenges lie: poor countries still facing high fertility and rates and rapid population growth. For all the talk about population decline in a few rich countries, the global population is still rising rapidly. The population of Uganda, 5 million in 1950 and 25 million today, is expected to reach 127 million by 2050; Pakistan, 38 million at independence in 1947, could reach 290 million by 2050. And while the UN's medium forecast suggests that the world population may come close to stabilization by the end of this century, this depends on fertility rates declining in countries where until now there has been very little reduction. This very rapid population growth in underdeveloped countries, when it first emerged in the 1950s and 1960s, was seen as a clear problem, an impediment to economic and social progress. Two adverse consequences were in particular stressed. First, the possibility of Malthusian limits to growth of population densities beyond the capacity of agriculture to support. (See article by Lord Haskins). Second, the phenomenon of capital shallowing—a higher birth rate and faster population growth means a lower per capita stock of capital, both because the savings rate would be lower and because each generation would inherit less capital per worker from the previous generation. A low per capita stock of capital would in turn have a direct negative impact on the level of productivity, and thus on the income per capita attainable. While these theories were challenged during the 1970s and 1980s, the emerging consensus is that rapid population growth is associated with poor economic performance. Chinese fertility decline is unusual in that its one child policy brought into the demography of a low income country fertility rates usually observed only at later stages of development. That policy is, with reasonable certainty, believed to have reduced the population versus the counter factual of no policy initiative by 300m to 400m, with annual cohorts now entering the workforce about 20m versus perhaps 40m without the forced fertility decline. That reduced youthful population has made possible a far more rapid accumulation of both physical and human capital than would otherwise have been possible. Chinese household savings have risen dramatically from 5% of household disposable income in 1978 to more than 30% by the mid-1990s, with much of this increase directly attributable to demographic effects. A rapid accumulation of capital has, as argued earlier, played a crucial role in Chinese economic take-off. China today simply has more capital per worker – more and better roads, ports, power capacity and factory equipment – than, for instance, all African countries. And this is one crucial reason why China is less poor than Africa and getting richer quicker. In addition, it seems highly likely that China's low fertility rate has greatly enhanced China's ability to navigate the stresses of rapid urbanisation and industrialisation without mass unemployment, or severe political and social tensions. There are of course very good reasons for objecting to the enforced nature of the Chinese one child policy, but those should not lead us to underestimate the positive impact which that policy has almost certainly had and will have over the next several decades on Chinese economic performance. And, while there are good reasons for being reticent about telling developing countries that they must contain fertility, that should not lead us to underestimate the severely adverse impact of high fertility rates on the economic performance and prospects of many countries in Africa and the Middle East. The arguments outlined above in relation to the developed and developing world suggest an overall global issue, which is whether the world will achieve the population stabilization that is likely to be optimal, or whether the long-term pattern will be either perpetual, harmful growth, or significant and suboptimal decline. While the latter threat may at some time emerge and require policy responses, the dangers of the former are clearly more pressing today, and may continue to be more pressing even in the second half of the 21st century. After only gradual and irregular growth from 1000 to 1700, a rapid takeoff began in the 18th century, initially concentrated in Western Europe and its offshoots and in China, and more recently in India, Africa and Latin America. That growth has been unleashed by falls in infant and child mortality, which increased "effective" fertility rates, and by falls in later life mortality, which extended life expectancy post childhood. The global population, continues to grow rapidly due to high birth rates in many developing countries: birth rates which are impeding economic progress and in turn therefore delaying the transition to lower fertility. 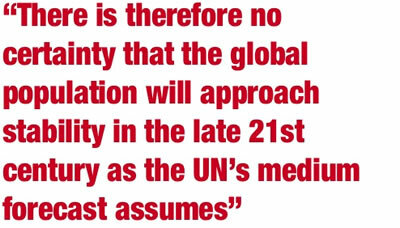 There is therefore no certainty that the global population will approach stability in the late 21st century as the UN's medium forecast assumes. This continued rapid growth in global population has major and adverse consequences for the global environment, increasing the pressure on natural habitats and scarce resources (like water). In particular it greatly increases the long-term challenge of achieving adequate carbon dioxide emission reductions to mitigate potentially harmful climate change. To achieve both economic progress in poor developing countries and global environmental balance, rapid reductions in fertility rates in the high fertility countries would be highly desirable. Despite the conventional wisdom, therefore, that we in the West need to be breeding more, or attracting more immigrants, the problem is quite the reverse. The world as a whole must hold back—the planet has more than enough people than it can cope with.